Welcome to our site. We appreciate you taking an interest in our firm, Colorado TBC. Colorado TBC is a trade name for The Best Company Inc., which is a small, close-held corporation that was founded in 1984. Colorado TBC is incorporated under the laws of the State of Colorado, with current Foreign Corporate Registrations in the states of Nevada, Hawaii, California and Utah. We currently possess licensing to perform contracting work in Nevada, California, Utah and Hawaii. The principals of the company are Lester Clark President, Norman (Butch) Clark Executive Vice President and Robert Clark Secretary/Treasurer. The three combine to have over 108 years of industrial construction experience. Lester and Norman got their industrial start in the heavy mining and petrochemical sectors while Robert worked on the business administration side of large power generating projects and operations. Colorado TBC started in the petrochemical but then transitioned into the geothermal sector and has been working on geothermal projects since. With the past background of process piping and large scale mechanical erection encompassing a varied working knowledge and background in the industrial construction sector it was a perfect fit for Colorado TBC. 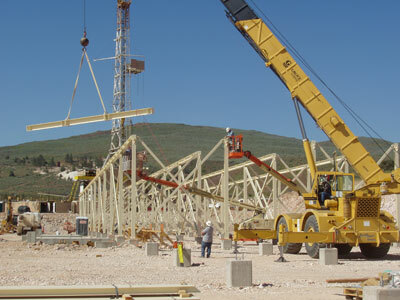 Colorado TBC, in addition to a full charge Construction Company with established Loss control, Right to Know and QA & QC Programs, has established Construction Management capabilities that pair with skilled Supervision to ensure the work is performed in a safe, efficient and workman like manner. We appreciate you visiting this site so look around and see what we are about. If you need more information or would like to talk with us feel free to contact us using Contact Us tab.